I love the pure unadulterated joy on their faces. Julibant Brooklyn Dodgers gather around the piano in the clubhouse at Ebbets Field in their impromptu celebration over the clinching of the National League pennant. 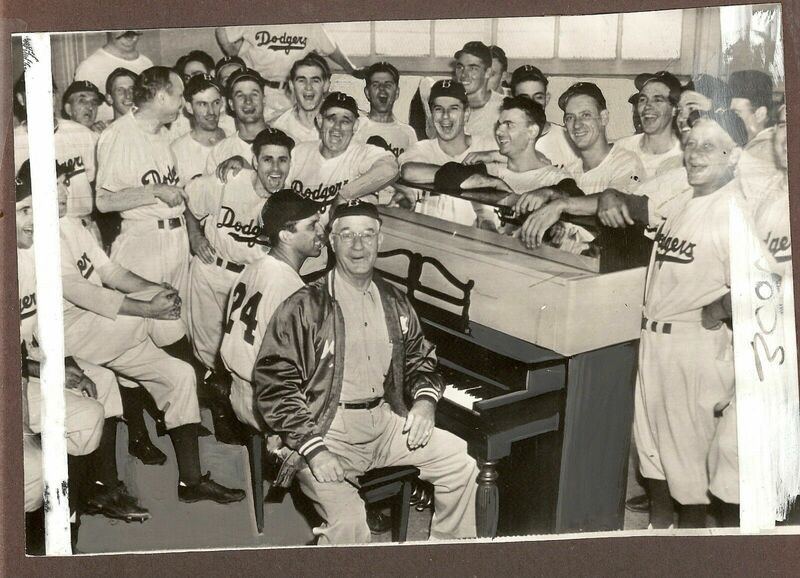 Playing the piano for the musically inclined team is catcher Bobby Bragan. Seated on the end of stool in the foreground with a broad grin is Manager Burt Shotton. Can you just imagine the Dodgers, or any team for that matter, pulling out instruments during a clinching celebration? UPDATE: Who's the guy (with his face cut-off) on the top-left corner with the fantastic mustache? I need to know! This Day in Dodgers History: In 1956 Dodgers owner Walter O'Malley, in a last ditch effort to save baseball in Brooklyn, lends his public support for a Wagner-Cashmore plan to build a $30-million Brooklyn sports center -- promising to purchase $4 million worth of the bonds. Unfortunately of them, lack of funding from the city's Board of Estimates killed the plan. In 2014 the Dodgers signed a free agent minor league contract with third baseman Justin Turner. He had just been released by the Mets, and was only given an invitation to spring training by the Dodgers. To the surprise of many, Turner would have a breakout season and become an important leader in the clubhouse. Podcast: Dodgers Nation - Struggles in Los Angeles, ITFDB, Funky Muncy and more: Dodgers Raw | Episode 40 (Podcast Link). Via Rowan Kavner at Dodger Insider; "UCLA, USC to face off again in Dodger Stadium College Baseball Classic." I can't begin to tell you how horrible this makes me feel. I've always had a kind-of macho attitude when it comes to netting on the field level. I hated that they are expanding, but I am now reconsidering that; especially given this recent tragedy. Per Karma Allen at Yahoo/Good Morning America; "Husband of Dodgers fan fatally struck by foul ball: 'We didn't have time to react'"
"The last thing I remember asking her was, 'Are you OK?' when the ball hit her and she said, 'No,'" Erwin Goldbloom said. "If they would've raised the vertical net, I think the ball would not have hit us." Erwin Goldbloom said he doesn't blame the Padres player who hit the ball or the Dodgers for his wife's death, but he wants baseball fans to be aware of the risks of sitting near the field. "They should make more of an effort -- MLB not just Dodgers," Erwin Goldbloom said. "The past is the past. We can't change that. We just hope that MLB will make it safer for other people." Ron Cervenka at Think Blue LA break a little bit of news in his story today; "Be sure to thank Andrew Friedman when you get to spring training." He mentions that prospects Dustin May and Gavin Lux will both be non-roster invitees to Major League camp during spring training. Congrats! Per Bill Plunkett at Baseball America; "Jeren Kendall Strives For More Contact." Per Dustin Nosler at Dodgers Digest; "2019 Dodgers Top 100 Prospects: 50-41." You can check out prospects #40 to #31 here. I found this this totally fascinating. Per Jason Kottke at Kottke.org; "The Forgotten Father of Pizza in the USA." The Skeeters have signed 11-year MLB veteran James Loney as a pitcher and position player.